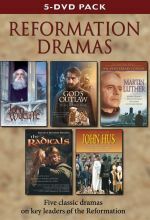 Based on the Gateway Films/Vision Video church history film series, these six half-hour programs vividly bring to life the Reformation, its colorful leaders, and history-shaping turning points. 1. John Wycliffe - Called the "Morningstar," this courageous forerunner paved the way for momentous changes to come. His teachings challenged the authorities, but they exiled him, and his exile provided the opportunity for his monumental achievement that has benefitted us all -- the Bible in English. 2. John Hus - He carried forth Wycliffe's groundbreaking work. His passionate calls for reform brought him before the Council of Constance. There he was betrayed by false accusations. He refused to capitulate and was condemned to burn at the stake. He died singing. 3. Martin Luther - He wanted only the quiet solitude of the monastery. There this guilt-burdened monk discovered the freedom of the Gospel. He couldn't keep quiet about it, nor could he stop the relentless swirl of events that propelled him to a decisive role in the shaping of the modern world. 4. 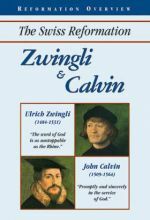 Ulrich Zwingli and John Calvin - They led the Reformation in Switzerland. Both capable scholars, they had to interpret the newly recovered dimensions of the Gospel in the midst of a hurricane of change, social chaos and fierce opposition. From Zurich and Geneva their writings and developments would permeate the church worldwide. 5. The Anabaptists - Called "the Radicals," they were opposed by just about everyone--Catholics, Protestants, and political leaders. Two of their earliest leaders, Michael and Margaretha Sattler, were executed for their beliefs while still young, but their legacy endures to this day. 6. God's Outlaw: William Tyndale - This humble, young scholar became one of the most hunted fugitives ever, pursued by King Henry VIII, Cardinal Wolsey, Sir Thomas More and others. His crime? Translating and circulating the Bible in English. He was caught and killed, but his unquenchable vision was marvelously fulfilled. As Christians living in lands where we enjoy religious freedom we are apt to forget the price that so many have paid for their faith. As Christians with a great wealth of theology at our disposal, we also forget that the faith as we know and love it has been bought with the price of much blood. The history of the church is filled with stories of men and women who advanced our understanding of the Scriptures only at great cost to themselves. Even those who did not sacrifice their lives often paid a terrible price as they were despised and rejected by their peers. We owe a great debt of gratitude to those whom God chose to use in this way. 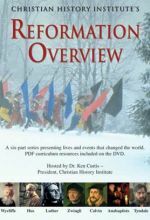 Reformation Overview provides brief, half-hour overviews of some of the men who were used by God to carry-on the faith. 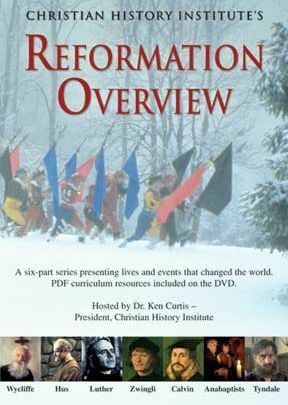 Based on the Gateway Films/Vision Video church history video series, this DVD combines narration from Dr. Ken Curtis, President of the Christian History Institute, with clips from the film series. Divided into six equal segments, the series examines several of the most prominent Reformers: John Wycliffe, John Hus, Martin Luther, Ulrich Zwingli and John Calvin, The Anabaptists and William Tyndale. Dr. Curtis brings narration directly from many of the scenes that are so important to church history - the pulpit where John Wycliffe preached his final sermon; the monument that marks the spot where Jon Hus’ was burned; the door of the Wittenburg Cathedral; the room where William Tyndale translated the Scriptures into English. History comes to life not only through a glimpse of these locations, but through the films. The lessons the viewer will learn from this series are clearly beneficial. He will learn of the conflict that has always followed God’s people as they sought to understand the Scriptures and spread the gospel message. He will learn of the price that so many Christians have been privileged to pay for their beliefs. He will learn of the great faith displayed by so many faithful servants of the Lord. Ultimately he will have his faith strengthed and hopefully understand how important it is that we remain students of history. The old adage that “those who ignore history are doomed to repeat it” seems especially significant in the church, which so often seems set on erasing its collective memory of the past. There is church history past 1972 and it is critical to our faith that we maintain a link with the great Christians of days past. Included on the DVD are two PDF files, one of which is a 24-page student workbook, and the other a 48-page leader’s guide and optional Bible study. 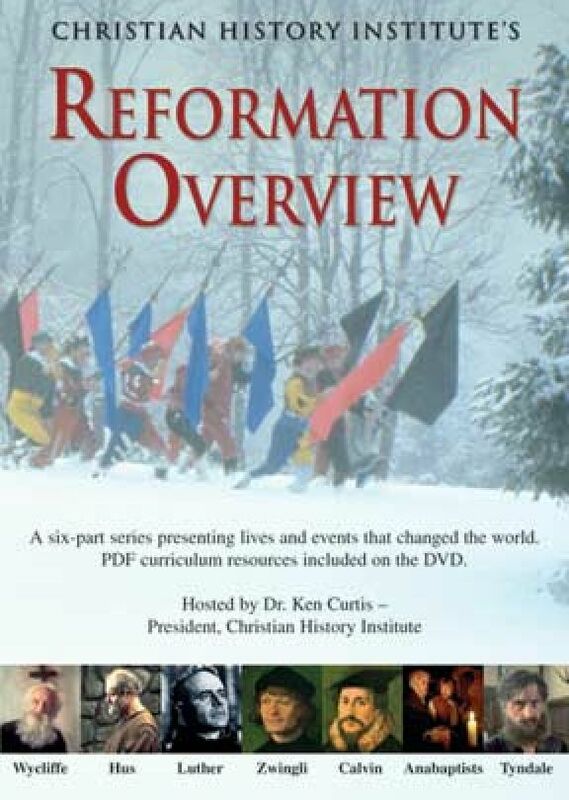 This adds great value to the presentation and makes it useful for Bible studies or part of a home schooling curriculum. This series is a perfect addition to a church or school library. If your local public library allows donations, consider adding this to their collection.